What is that red board bottom centre? i’m not talking about the bottom pic. What is that red board bottom centre of the 1st pic ? Something with a screen (OLED/tft), RFM69, 4 wires leading to some other tiny thing pointing to the from of the panel. Four lcd screens, connected to Raspberry Pis with adapter boards for connecting said screens to HDMI. Seems to have a speaker, so maybe a display for connecting and using the badges to play a game ? Ooh, good call with the badge connection! Several Pis connected to screens with some speakers and mystery hardware in the bottom. I’m going to guess that it’s a comparison between different ways to do a certain task. And almost certainly badge related given that red board on the bottom. What a guess! This is indeed the correct answer. Voja Antonic who designed the hardware for the Supercon badge has been working on this replicate of the Hal 9000 Console to show as a demo at the conference. We’ll be in touch shortly to get the badge you won sent out to you. Congrats! I’m sorry Mike. I’m afraid I cannot do that. Yep, that was my first thought too. Nice touch with the ambient noise played the whole time! Sounds just like the systems of Discovery One. It’s the noise of the fan on the 12V/20A power supply, erroneously ordered instead of the fanless one. When you add the sound level compressor of the camera, it really sounds bad. Will be replaced soon. 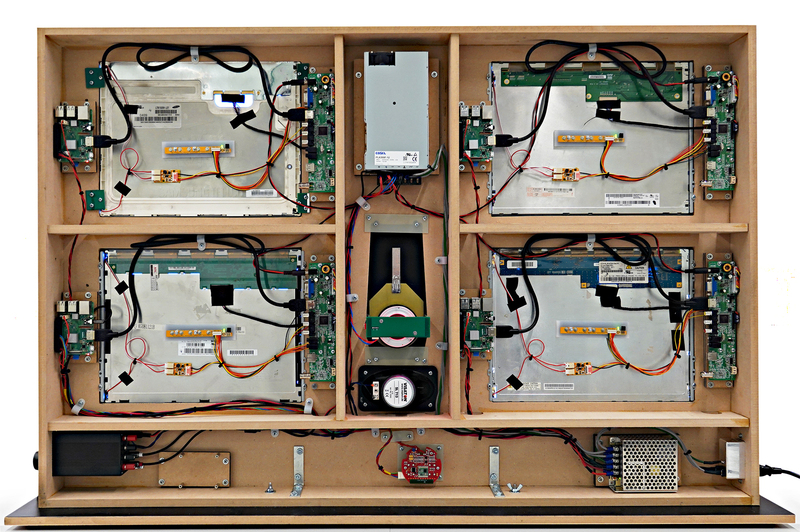 Four LCDs with touchscreen controllers, power supply in lower right, audio amp/volume control in lower left, speaker in middle above the bottom partition, another power supply top center. I don’t know what the bottom circular board is or the vertical trapezoid-ish thing is in the center. I’m guessing some kind of 4-player touchscreen game. That is, four LCDs with touchscreen controllers driven by R-Pi’s, of course. Looks like a display panel using 4 Raspberry Pi’s to drive 4 touch screen monitors (~10”?) independently with a common sound source in the middle. A 4 screen game or customer interaction piece. Possibly a data monitoring station? Whatever it is, looks great! So, four tfts with a pi each. Bottom left pi looks like the master. It has audio out and the io connector goes to the round red board, which has a 433/960 MHz transceiver but I’m guessing also a display on the front which is what it’s being used for. The coil(?) centre middle is maybe inductive charging or a magnet. I’m guessing maybe you dock a phone on it which the pi’s talk to? ah damn… I knew it, too. 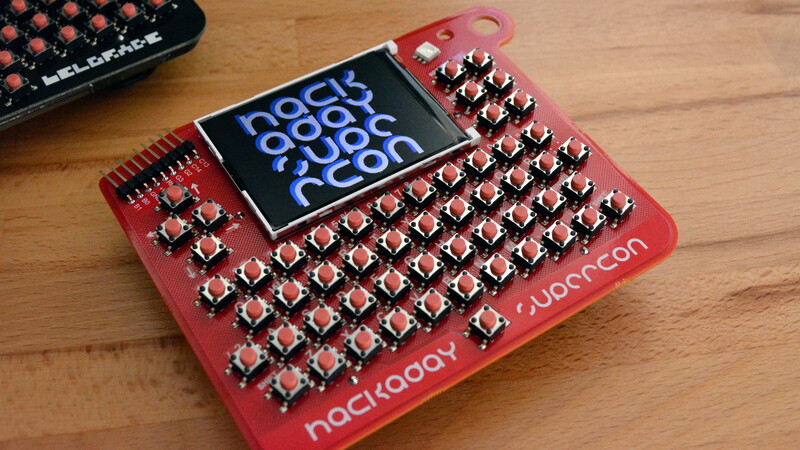 I have to agree with pretty much everything said here and could go on about 4pi yada yada however what this is built for is supposed to be for a hack conference. So I am going with what it’s for vs what it’s obviously made of. I believe it was made to have some kind of interaction hack for one individual at a time since it’s too small for a multi interactional device. This hack will lead the individual from one screen to the next and then incorporate all four at once revealing a rabbit hole. At which point Alice, it will be up to you to push the big red button and choose if you fall down it or not. Thereby hacking your way into Woderland and the altered reality thereof. I highly suggest wearing your top hat, bringing your drink me eat backups and a tea cup, (no one likes to drink out of a dirty cup). See you in the other side!! I see that I have to explain the red round board at the bottom. It’s the PIR motion sensor, the part of another project which is not related neither to HAL nor to the badge. There is a clearly visible 915 MHz module, which is disconnected and has no function in this project. About the audio amplifier… when someone walks in front of HAL, motion sensor randomly triggers one of 30 HAL’s sentences from the movie. That’s why the lower left Raspberry is connected to the amplifier and has an extra wire from the motion sensor board to GPIO 24. Did you build the HAL 9000 module in the center or source it from Thinkgeek (or some similar replica store)? Sounds like a future write up to me???? That hope RF module really threw me off. oh never heard of the 2061 ??? It should do that as part of the shutdown sequence.